Park Yoohcun is showing eight-color charm as an actor. Park Yoochun is playing the role of Crown Prince Lee Gak in Joseon Dynasty and modern character Yong Tae Yong in SBS drama “Rooftop Prince“. In order to uncover the truth of the murder of Crown Prince, Lee Gak from Joseon Dynasty is living in the name of Yong Tae Yong, through the roles in the drama, he shows to viewers and fans a variety of images through acting. Through “Crown Prince”, Park Yoochun plays two roles as one person, and an additional role which is the combination of the two characters. He portrays these variety of characters by paying detailed attention on different ways of speaking and tone, and change of emotions according to the plot. Firstly, Park Yoochun shows the strictness of Joseon Dynasty Crown Prince, and also the deep feelings for the Crown Princess. Later, he travels through time to the modern era. As a people from the past, he unable to adapt to the modern environment, and shows the lovely and funny charm. In addition, he also interprets well the modern character Yong Tae Yong, who is a person wants to take it easy and doesn’t like to be confined. It’s completely opposite role with Lee Gak of Joseon Dynasty. 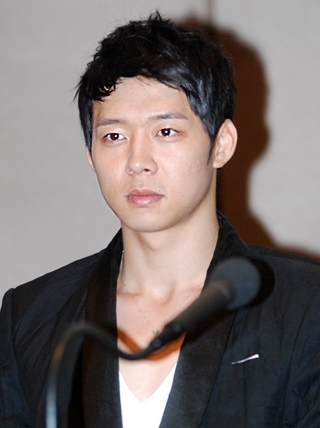 Park Yoochun began to shine with one person acting in two roles of Lee Gak and Yong Tae Yong. Viewers would have felt that the significant difference between the two crossover roles from two completely different world. In the episode 13 of “Rooftop Prince” aired on May 2nd, 2012, the ‘real’ Yong Tae Yong who previously thought to be dead after falling into the sea reappears, and his charismatic performance is really eye-catching. The short scene as simple as just lying on the bed, turning his head and without saying a word, although less than one minute of time, but he has made a prideful impact to the viewers. Among the characters that played by Park Yoochun, Lee Gak who forged the destiny with Crown Princess and lives in the name of Yong Tae Yong with appropriate mixture of personality in the past and present is the most attractive. From stiff Joseon languge to shoddy modern language, Lee Gak has mastered the abrupt change, and has become ‘Yong Tae Yong’. In the process, the acting and charm of Park Yoochun reach a peak. To his acting, such a wide range of emotions, there would be formidable worry and difficulty during the actual acting. But he completely eliminates the worry of viewers and production crews, successfully interpreting the variety of images that fit the roles. In fact, in drama, to wholeheartedly and perfect portray a role is not easy, but Park Yoochun has surprised people with his amazing ability in interpreting and portraying the two roles via single person. There is reasons for Park Yoochun to shin as an actor and received a lot of praises. Recently, his tattered script was made public and become a topic. And he also has the passion for acting. He is burning with passion for acting in “Rooftop Prince”, and also proven his acting skill. Through this drama, it’s an indisputable fact that he has solidified his position as an actor.